A Complete Arabian Experience Dubai makes a very pretty picture from the sea. In the evenings the sight of the illuminated city is particularly beautiful. Cruise the creek in one of the traditional dhows for a romantic evening experience by itself. Dhows are still built today in much the same fashion as they used to be generation ago. It is an educational to watch craftsmen curve the hulls and hammer the planks together into beautiful dhows with nothing more to guide them in mental notes of plans handed down via word-of-mouth through the generations. Cruise on Ramees traditional wooden Dhow to view the beautiful skyline of Dubai from unique and different perspective is an unforgettable experience. Tour Dubai offers a fascinating glimpse of the radiance of Dubai at night, where our esteemed, loyal and royal guests can bask in the cradle of Khor Dubai-the Dubai Creek. 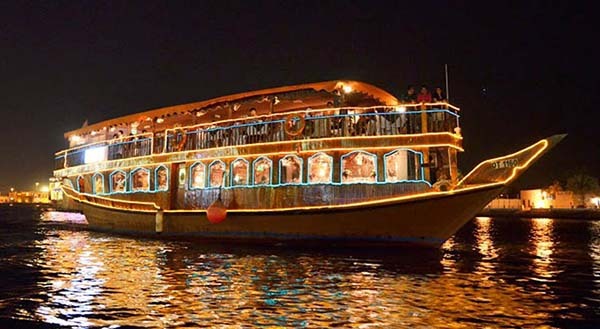 At Tour Dubai Dinner Cruises, we pay attention to every detail that combines unique and bespoke services at reasonable prices. We cater to individualistic as well as larger group events to provide customers with a memorable and enjoyable experience. Our dinner cruises unfold the shimmering high-rise structures that surround the creek, whilst sailing under bridges and in view of marvelous architectures such as the National Bank of Dubai, Chamber of Commerce Building and much more. Rustar Cruise Dubai is all about novel experience, the one and only rustic Arabian environment amid the modern facilities, the royal treatment, and fascinating interior and purely delicious five star menus. The wooden Rustar Cruise provides you a natural and soothing environment that makes Dubai even more beautiful. It is the world’s best floating restaurant that offers you to see the scenic landmark of the city from a totally different angle. The amazing and romantic setup will surely give you so much inner joy that you are missing at the moment.